Opening times Apr 1–Oct 31: Daily 10am–5pm; Nov 1–Mar 31: Wed, Thu & Fri 11am–3pm; Sat & Sun 11am–4pm; closed Mon & Tue. Dorothy, a young girl from Kansas, is whisked away by a twister to the magical Land of Oz. Accompanied by a brainless scarecrow, a heartless tin man and a cowardly lion, Dorothy and her dog Totp folllow the yellow brick road seeking the Wizard of Oz. A feelgood musical for all ages. 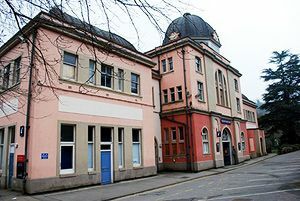 The Grand Pavilion Matlock Bath was built in 1910 to entertain and shelter tourists; up to 17 excursion trains a day came to Matlock Bath, which has one of the longest station platforms in the region as a result.